You are here: Home / Yes on 46? Proposition 46 would allow victims of botched abortions to get justice and sue negligent doctors. Proposition 46 would also allow lawyers to effectively step forward on behalf of patients to discourage doctors from enacting medical-rationing and intentional medical-abandonment of patients, as promoted by the Obamacare system of health care. At present, elected officials in California state-government, and many California courts, are going out of their way to promote, protect, and defend the abortion industry. When the state will not step forward to defend the lives of the vulnerable, there is only one answer: the civil courts. In California, the cap on pain and suffering damages for medical negligence was set in 1975. It has not been changed since then. In 1975, the cost of a new home was $42,600. Median household income was $11,800 and the cost of a stamp was 10 cents. Also in 1975, when someone was harmed during an abortion or denied life-saving care their life was valued at $250,000. As a result there is an economic disincentive for lawyers to take on these difficult but important cases. 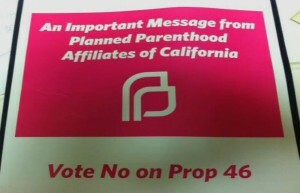 Planned Parenthood is telling people to Vote No on Proposition 46. Surprised? Proposition 46 would index the 1975 amount for inflation and make it more feasible for those harmed by the abortion clinics like Planned Parenthood and health-care rationing, to get justice and hold malpracticing physicians accountable. Proposition 46 also provides greater accountability for irresponsible use of medicine. Obamacare, the most oppressive and obvious government/bureaucracy control of human lives in the United States, has now become the law of the land. Thankfully, many states are now eviscerating Obamacare. The lone exception is California, where the legislature and executive branches are in fact doubling down on the government-control of medicine and ‘crony-implementation’ of medical care. Prop 46 allows incompetent physicians to be held accountable by the civil legal actions of individual citizens. As a matter of ethical guidance because of 1973’s Roe decision, the entire medical profession has been challenged and rocked from its guiding principle of ‘primum non nocere’ (‘the first rule is do no harm’). The implications have grown and snowballed, such that what were once ‘clear lines of medical ethics’ are aggressively being challenged. California ProLife Council PAC urges you to vote YES on Proposition 46. California ProLife Council recognizes that it is a first-principle of the law to protect those who cannot protect themselves.The notorious abortionist Kermit Gosnell in Pennsylvania was botching abortions and killing women for years. It still took years before the authorities got around to prosecuting him. In California, there are numerous botched abortions that occur that often go unscrutinized and un-prosecuted due to the political and legal sway of the abortion industry. However, under civil law, you can hire an attorney to sue to ensure that these ‘doctors’ are brought to justice. Additionally, under Obamacare, there will be medical rationing in California. Doctors will soon be making drastic choices about your loved ones’ health care and whether they should live or die. It’s important that we have the ability to use the civil law to combat these politically-protected doctors that don’t agree with you and your values. By ensuring the law protects human life, it prevents many of the methods that the government uses to determine which lives are not important. We need the civil law to protect those who cannot protect themselves. Simply because lawyers support a Proposition does not make it bad. For example, trial lawyers are also First Amendment litigators and make plenty of money from these cases. However, that does not automatically mean the First Amendment is bad. It is actually the new introduction of Obamacare (the Affordable Health Care Act) that has brought sweeping government control over health care. Prop 46, in fact, restricts the government’s ability to place a minimized-value on your very life. It is actually Obamacare that is now causing Health insurance to skyrocket (this is particularly the case in California). The Legislative Analyst’s Office notes that there is a “potentially significant” amount in state and local government savings from the new requirements on health care providers as a result from Prop 46, such as provisions related to prescription drug monitoring and alcohol and drug testing of physicians also mentioned in the Proposition. California already has an effective and successful system to regulate medical malpractice insurance premiums – a system that won’t change because of Prop 46.